Snoogle® is the original body pillow by Leachco, a family business located in Ada, Oklahoma. 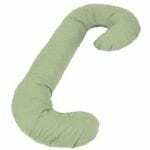 It was designed by Jamie Leach, a registered nurse, as a pregnancy (maternity) pillow. Leachco calls Snoogle “the mother of all pregnancy pillows®,” apparently claiming it as the first in this sub-class of body pillows. Amazon tags the Leachco Snoogle Total Body Pillow as the “#1 Best Seller in Body Pillows.” With 8,496 customer reviews as of 12/31/2017 (7,757 Verified Customer Reviews-VCRs), it is far ahead of Leachco Back ‘N Belly Contoured Body Pillow (3,227), Snuggle-Pedic Shredded Bamboo Combination Memory Foam Body Pillow With Kool-Flow Cover (3,658), and Aller-Ease Cotton Hypoallergenic Allergy Protection Body Pillow, 20″ x 54″ (1,444) [the Coop Home Goods Total Body Pillow (994) would qualify if it had 6 more reviews]. However, its average customer rating of 4.3 of 5 stars is less than that of the Snuggle-Pedic (4.7) and the Coop (4.5), and tied with the Aller-Ease (4.3). The higher sales can be attributed to the demand for maternity pillows and to the prior introduction of the Leachco Snoogle and its longer time in this niche market. The Leachco Snoogle Total Body Pillow (Original) is shaped like a semi-serif capital J. Its dimensions are 60″ x 24.8″ x 7.2″, and it weighs 3 lbs. It is filled with polyester fibers and covered with a polyester liner and a poly-cotton cover. Snoogle is now not just one pillow, but a family of pillows. This model (the Original) is a variation of the first, the Basic. As can be seen in the cart below, the variations are classified by the type of cover: Basic is not removable, Original is sham-style (open at one end) and removable, Chic is a zippered removable cover. They also differ in the default cover fabrics. For Basic and Original, it is a blend of 65% polyester and 35% cotton with the all-cotton option. With Chic, the cotton is standard and the blend optional, with variation for the cotton (jersey, organic, t.c. 300). These are listed separately by retailers. It may seem odd that the top seller in body pillows has a lower rating than two other top-selling body pillows and is tied with a third. One reason may be that it is a specialized design (maternity), while the other three have the basic I-shape. Body pillows in J, C, and U shapes will be less suitable for some users and more suitable for others, which accounts for the large number of pregnancy pillow models by Leachco. The extra bulk makes these pillows harder to handle and separates sleeping partners. Also, removable covers are harder to put back on, a drawback mentioned in several of the positive Amazon reviews. Another reason for the difference in ratings between the Snoogle and Snuggle-Pedic body pillows may be in the fillings. The Snoogle is stuffed with polyester fiber fill, as are the other Leachco body pillows, while the Snuggle-Pedic is filled with shredded memory foam. A survey of body pillows on Amazon with over 100 verified customer reviews shows that those with shredded memory foam average higher customer ratings than those with other fillings, including polyester. Polyester fill fiber (poly-fill) and shredded memory foam are called “down alternative” materials, because they are soft and shapeable, but do not flatten out quickly. They are also breathable. However, poly-fill tends to become lumpy, especially after machine washing. Shredded memory foam is easier to shape and less likely to lump. It also has the conformability of cut or molded memory foam, but cooler, making it preferable over blocks of memory foam in pillows. The Snoogle Total Body Pillow has a cover and a liner. The liner is 100% polyester, while the cover fabric is 65% polyester and 35% cotton, as are the covers of most other Leachco pillows. Optional is OrganicSmart®, with both cover and liner made of 100% organic cotton. By contrast, the covers of Snuggle-Pedic and Coop Home Goods body pillows are blends of polyester and bamboo-derived rayon. 65/35 poly-cotton is a common apparel fabric blend, familiar to those who shop for and select clothes and sheets, so it is a natural choice, especially for pillows designed by a mother. The polyester/bamboo rayon blend is used on pillow casings and mattress covers for its breathability, moisture wicking, and silk-like feel. A quick survey indicated that for pillows with the same inner content, those with rayon (including bamboo rayon) in the covers tend to have higher ratings (but this needs closer examination). Of the 8,496 customer reviews, 6,859 (80.8%) were positive (4-5 stars), 717 (8.6%) were neutral (3 stars), and 920 (10.6%) were negative (1-2 stars). (1) It flattened quickly and the cover is extremely hard to replace back on after a wash. I feel like this was more money that I should have spent for a pillow that only lasted a short couple of months. (2) Waste of my money and effort to travel with it… bulky and uncomfortable. Not wide enough (for my liking) under my head and the rest just feels stiff. Went right back to using multiple pillows… maybe I will return to it once I get bigger. There is no direct review of Leachco products on Yelp, therefore no numbered score. There is, however, a complimentary remark about the Snoogle within a bad review of a local Babies ‘R Us store: “I do love the one [pregnancy pillow] I got, which is a Snoogle Leachco Brand.” She was disappointed with the store’s customer service, but was satisfied with this item. The Snoogle Total Body Pillow by Leachco is demonstrably a good buy for the intended market (expectant mothers). It is a very commendable design by someone without experience in the bedding industry who initially relied on home sewing techniques. It is also well-made, as evidence by the 81% positive response. Even well-made products have some defects slip through. The reasons for not using shredded memory foam are not stated, though it is a known material to home sewers, but Barry Cik, the founder/CEO of Naturepedic, avoids memory foam because of the chemicals used in its formulation. However, consumer response points to better performance by shredded memory foam than by polyester fiber. We calculate our ratings in accordance to our Verified Review Policy. The Leachco Snoogle Total Body Pillow has an average VCR rating n Amazon of 4.29. Consumer Search rated this as the best body pillow for pregnancy.